I finally did it, I refretted my first guitar, well I actually did it twice. 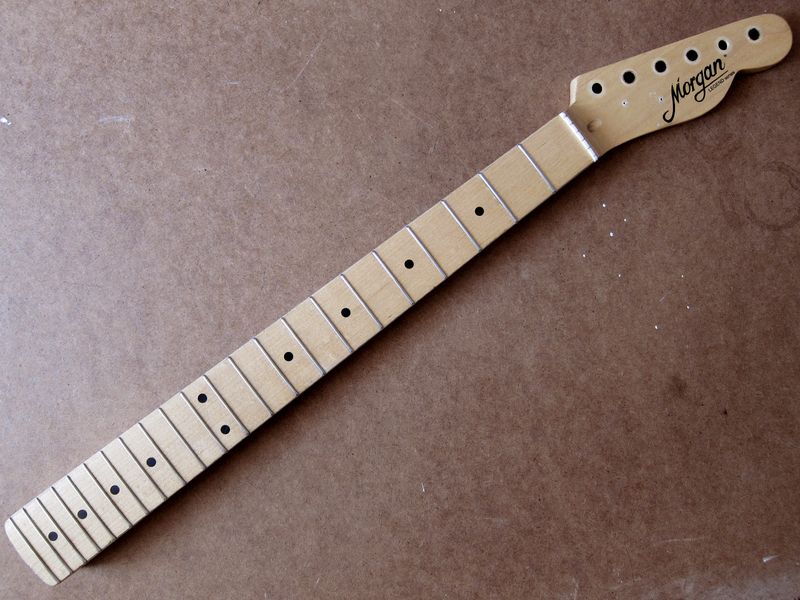 First out was my old Morgan Telecaster neck, a leftover from my first Claescaster. I don’t use it so it felt like a perfect neck to practice on, especially since it doesn’t have any binding. It was actually less hard work than I expected it to be, well it took some time to get the old frets out but still, no major issues. I just had to get over that first fear that I would break something and eventually build up some confidence that I knew what I was doing. First I checked that the neck was straight with a straight edge and adjusted the trussrod until it was perfect. 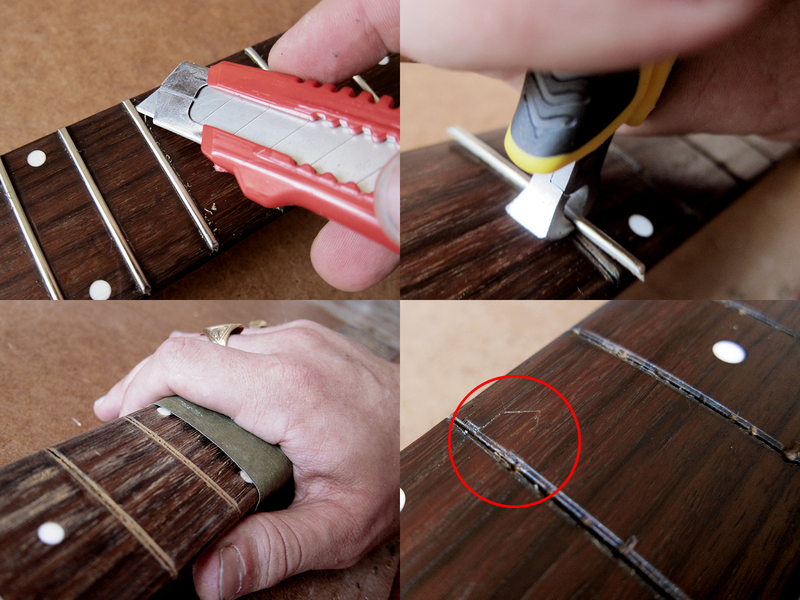 It was a lot easier to get the old frets out if you cut in a bit on each side with a sharp knife, it gave the pliers something to grip, but be careful so you don’t slip and scratch the fretboard, as I did. I used normal wood glue and then gently tapped the new Jescar FW43080 fretwire in place. 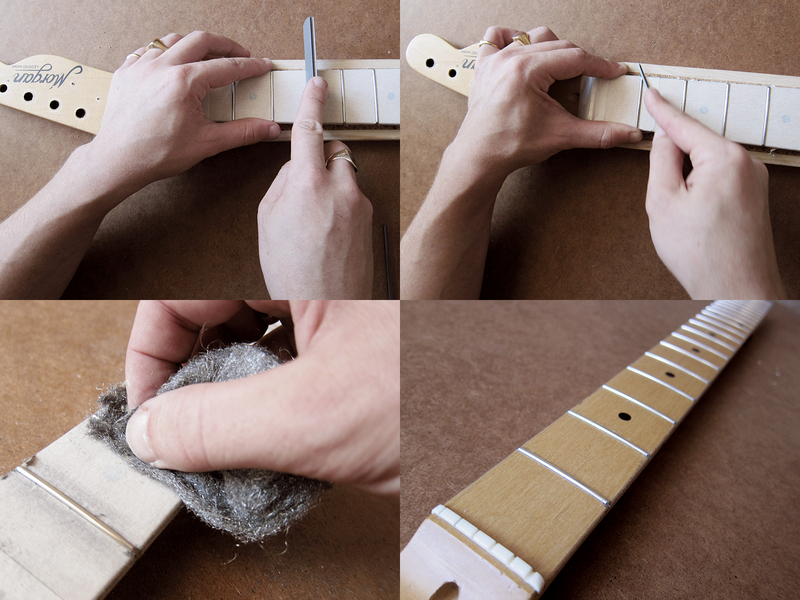 When the fret edges were cut I taped the fretboard with masking tape and then filed down the edges, first straight and then angled the file 45°. I checked that all the frets were the same height with a fret rocker and since they were I didn’t bother to level the frets, maybe I should have. I crowned them with a Uo-Chikyu medium fret crowning file and then softened the edges with a Uo-Chikyu edge file. I went of the frets with 400 and 800 grit and then polished until I couldn’t feel my shoulder with wire wool. I’m pretty damn pleased and proud of my first refretted neck. I decided to change the frets on my EKO Ranger VI as well, even thought I had just crowned and polished them two days ago. I want to get as much practice as possible before I start with the Tokai and to get a feel for the difference between rosewood and maple fretboards. I made a deep cut on the side of the frets which made it really easy to get a grip and pull out the old frets. 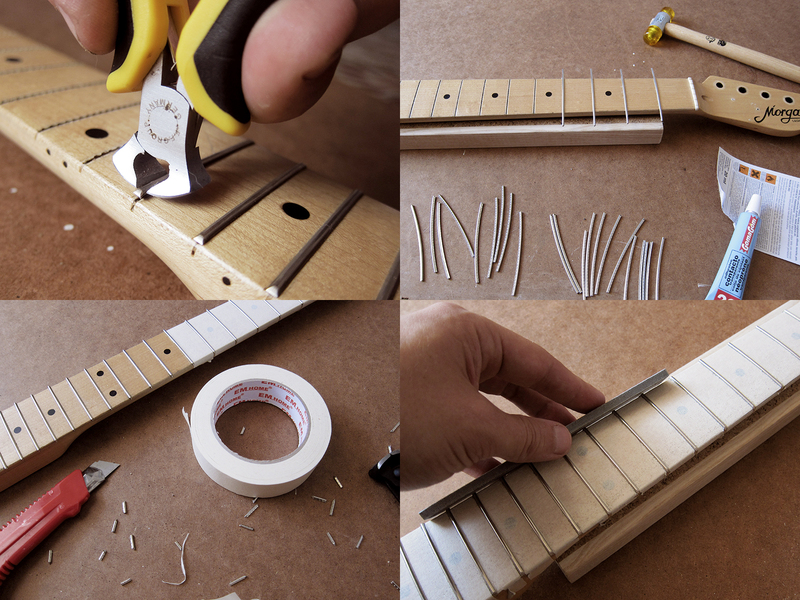 It was actually so easy that I forgot to be careful and just ripped them out and managed to chip the fretboard. Which in a way was good so I got the chance to glue the chip down, sand down and then polish the fretboard, now I know how to deal with that as well. Unfortunately I had bought some cheap non pre-radiused fretwire which meant that I had to try my best to get the correct radius by bending it which wasn’t that easy. I will never get that again, but at least now I know how annoying it is with fretwire that isn’t pre-radiused. I ended up with pretty rough edges, it felt like it was harder to cut than the Jescar, so I had to work a lot to file them smooth. 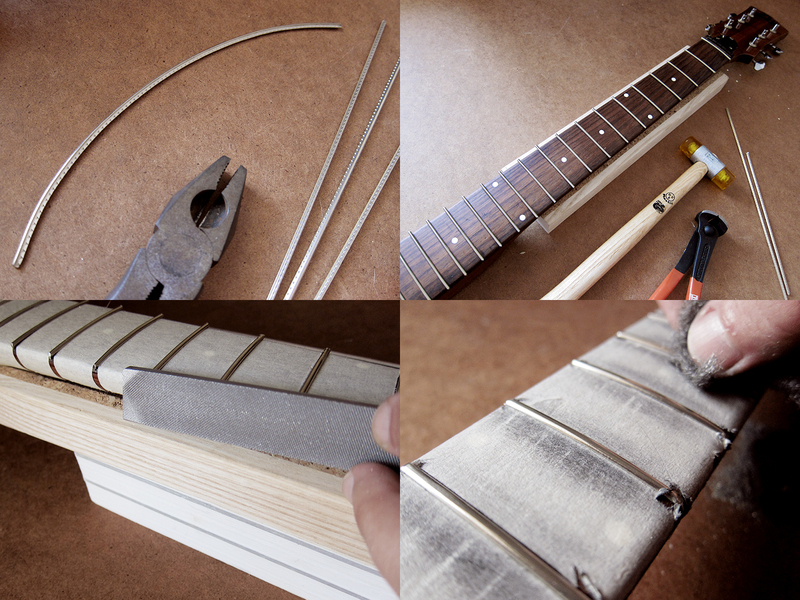 Then I levelled the frets, crowned them, filed the corners and polished with 400, 800 grit and then wire wool. The final result, a refretted EKO Ranger VI. 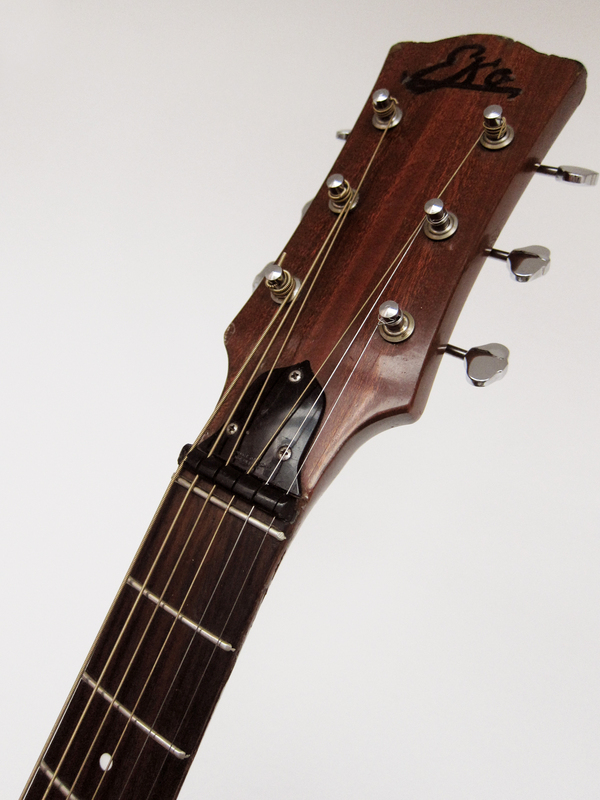 It used to have some dead spots around the 12th fret which disappeared straight away with the new frets.